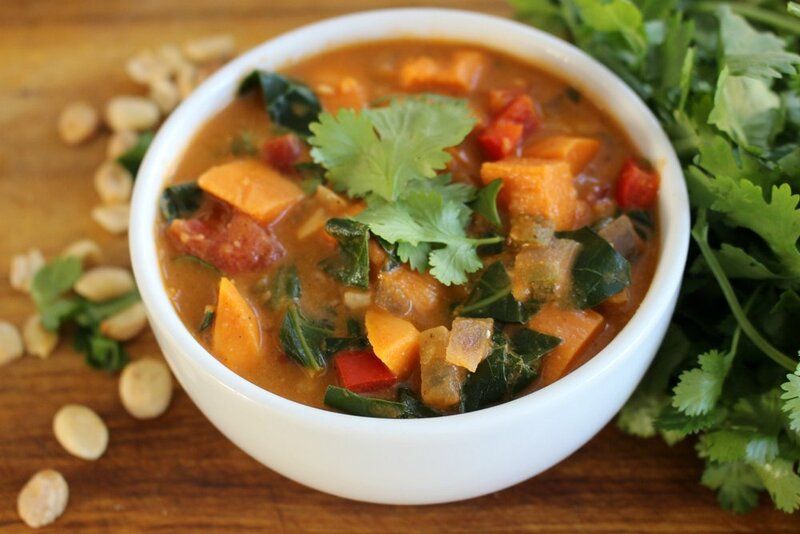 This stew contains a few of my favorite things: peanut butter, sweet potatoes, and lots of garlic and ginger! It's healthy, flavorful and easy to make; you can even throw everything into your crockpot at the start of the day and come home to it later. This recipe serves 2 or 3, but feel free to multiply it and make a large batch; it's a great option for a healthy meal prep, as the flavors actually improve as this stew sits in the fridge. Add a can of chickpeas, or serve it alongside brown rice for a hearty, protein-packed lunch or dinner. In a stockpot over medium heat, sauté onions, garlic, ginger and jalapeño in a few teaspoons of oil or water until soft and fragrant. Stir in tomato paste, sweet potatoes, red pepper, broth, and spices. Bring to a boil. Stir in peanut butter and reduce heat to low. Cover and allow to simmer for 15-20 minutes. Add in collard greens then cover and allow to simmer for 3-5 more minutes until wilted. Add salt to taste and serve with cilantro and chopped peanuts. You can also make this in a slow cooker by simply adding all ingredients at once.